Summer in the northern hemisphere is a great time to view the constellation Sagittarius by looking south and left of the bright band of the Milky Way. Picking out the archer centaur is much harder than spotting the 'teapot' formed by eight of the constellation's brightest stars. The reward for finding this teapot is that by concentrating on where the steam would emerge from its spout, you are peering at the center of our galaxy! There are billions of stars and a lot of violent goings-on in that direction, all driven by the galactic center's 4 million solar mass black hole. Why isn't the Milky Way even brighter to the naked eye? The problem is gas and dust in the galactic plane absorbing and scattering visible light. So we need another way to see this striking region of space. Radio waves in the low gigahertz regime travel nicely through these materials, so radio telescopes have been used to study our galaxy's engine. The latest and best is MEERKAT, a state-of-the-art 64 dish instrument for radio astronomy constructed in the Karoo area of South Africa. Just inaugurated, MeerKAT is a stupendous achievement - a veritable 'space-shot' for RSA - most of the specialized hardware and associated software was designed and built in South Africa in cooperation with industrial partners. 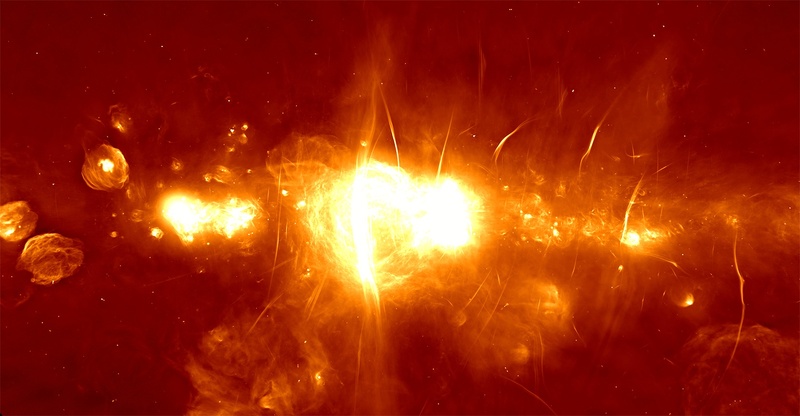 Here's a two by one degree image of our galactic center in radio frequency made by MeerKAT, showing mysterious magnetized filaments in much greater detail than previous sightings. Creating this image requires immense signal processing power, the first stage of which is provided by hundreds of SKARAB FPGA high performance computers that perform the important FX correlation calculations in parallel and real-time, on the fly. So congratulations to the MeerKAT team and our supplier Peralex Electronics, makers of SKARAB, for this extraordinary milestone. Scientists around the world will surely be clamoring for observations using this awesome instrument. What discovery will you make using SKARAB?